Shares of the organic food maker tumbled on accounting issues that have delayed its fourth-quarter earnings report. Shares of The Hain Celestial Group, Inc. (NASDAQ:HAIN) weren't looking so heavenly this past month as the stock fell 30% according to data from S&P Global Market Intelligence. 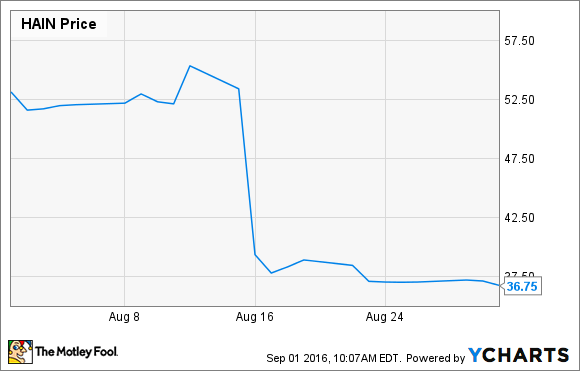 The parent of organic products including Celestial Seasonings tea was plagued by an accounting scandal, and the stock plummeted 26% on August 15, as the chart below shows. Hain said that day, when its earnings report was scheduled, that it would delay its annual earnings report due to its accounting problems, specifically citing revenue reporting concerns regarding distributors and when the revenue should be recorded. It is now awaiting an independent review before reporting its final-quarter earnings. Accounting scandals such as this one tend to be scary for investors, as the fallout is unknown and can sometimes lead companies to restate previous financial reports and even oust executives. This one does not seem as severe as others, however -- such as the one that shook Diamond Foods a few years ago -- and Hain said it didn't expect any changes to affect its overall revenue. Hain stock slipped another 7% after that news broke to close out the month, indicating that investor concern has only increased since the initial announcement. Today, Hain received notice from Nasdaq that it was out of compliance for not submitting its 10-K, and now has 60 days to file a plan to regain compliance. Separate from the accounting scandal, Hain stock has been challenged -- like its organic peers Whole Foods Market and United Natural Foods -- by the proliferation of organic foods in regular supermarkets, and is down nearly 50% from its peak last year. The company had expected revenue to grow 10% in the recently ended year to about $2.95 billion, but even after last month's drop the stock is still far from a bargain at a P/E of 18. Expect the company's next step to be submitting a plan to regain compliance with the Nasdaq and to say when its 10-K will be ready.